The staff exhibits patience and understanding. They also do creative things for residents…beer tasting events, best pie contests, events that bring people together! The grounds are beautiful, very well-kept. When you want something repaired it is done quickly and correctly the first time. This is one of the most classy apartment complexes in Madison and area. Why have I lived at Kearney Meadows for 9 1/2 years? Many reasons! The management team strives to beautifully maintain the building and grounds. I am very comfortable in an apartment with an excellent floorplan, pretty decor, and efficient appliances. I enjoy the underground parking, daily delivery of the Madison State Journal at my door at a very low cost, and a well-insulated apartment that keeps out noise, heat, and cold. The apartment has many well-arranged electric outlets and ample storage in every room. Any problems that occur are taken care of in a timely and friendly manner. Hear ye, hear ye folks: you won’t find a better place to rent in the Middleton-Madison area than Deer Creek Apartments. The office staff takes care of the residents as if they were family. 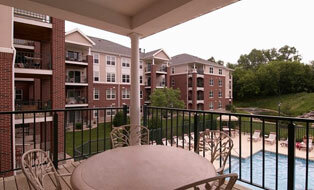 The apartment homes are very well maintained and extremely comfortable, well-insulated and quiet. Their security system makes one feel safe at all times. The grounds are beautiful and well-manicured in the summer, and the snow is always removed quickly in the winter. The clubhouse is an excellent place to meet people and to get a good workout too. We got great use of the pool. We have lived in numerous apartment complexes in the Madison area, and none have even come close to the quality of living that we experienced at Deer Creek.